This brush stroke is made with the Hard-Round 19 pixles brush. Once the texture is scanned in—Select All>Edit>Define Pattern—The texture will be added to the end of your pattens pallet. 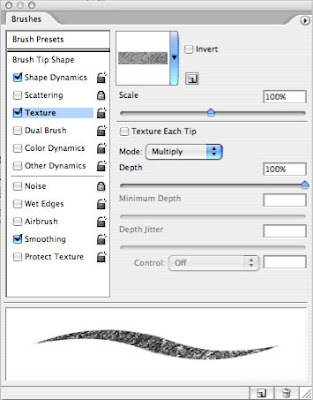 This brush stroke is made with the same Hard-Round 19 pixels brush, with the following changes in the brushes palette. I selected texture, selected the new texture from the patterns palette and changed the brush mode to Multiply. This brush stroke (red) is made with the same Hard-Round 19 pixels brush, with the mode changed to Subtract. Notice that it is a is opposite. This is a combination. The green is the brush with the mode set to multiply and the red is the same brush with the mode set to subtract. This is a very basic concept. Give it a try and let me know if you have any questions. That's cool... always something new to learn in Photoshop. Oooo! Great lesson! I'm coming back and looking again when I have some extra time to play around with Photoshop. As a self-taught beginner, this kind of stuff is invaluable.